Since the discovery of the expansion of the Universe by American astronomer Edwin Hubble in the 1920's, by measurement of galaxy velocities, astronomers have tried to learn how this expansion changes with time. Until now, most scientists have been considering two possibilities: the expansion rate is slowing down and will ultimately either come to a halt - whereafter the Universe would start to contract, or it will continue to expand forever. However, new studies by two independent research teams, based on observations of exploding stars (supernovae) by ESO astronomers  with astronomical telescopes at the La Silla Observatory as well as those of their colleagues at other institutions, appear to show that the expansion of the Universe is accelerating . The results take the discovery of the cosmological expansion one step further and challenge recent models of the Universe. If the new measurements are indeed correct, they show that the elusive "cosmological constant" , as proposed by Albert Einstein , contributes significantly to the evolution of the Universe. The existence of a non-zero cosmological constant implies that a repulsive force, counter-acting gravity, currently dominates the universal expansion , and consequently leads to an ever-expanding Universe. This new research is being named as the "Breakthrough of the Year" by the renowned US science journal Science in the December 18, 1998, issue. A Press Release is published by the journal on this occasion. the amount of "other energy" present in space. From the measured values of these fundamental parameters, the age of the Universe and the geometry of space can be derived. They have been the focus of a large number of astronomical programmes over the past decades. Many aspects of the currently preferred cosmological model, the Hot Big Bang , have been impressively confirmed by observations of the expansion of the Universe, the cosmic background radiation, and also the explanation of the synthesis of light elements. Still, our knowledge about the dynamical state of the Universe, as well as the early formation of structures, i.e., of galaxies and stars, is far from complete - this remains a field of active research. Possibly, the simplest way to test our present assumptions in this direction is to measure accurate distances and compare them with the expected cosmic scale. This is where the recent results contribute to our understanding of the Universe. The two research teams, both with participation from ESO , have concentrated on the study of rare stellar explosions, during which certain old stars undergo internal incineration. In this process, explosive nuclear fusion burns matter into the most stable atomic nucleus, iron, and releases a gigantic amount of energy. 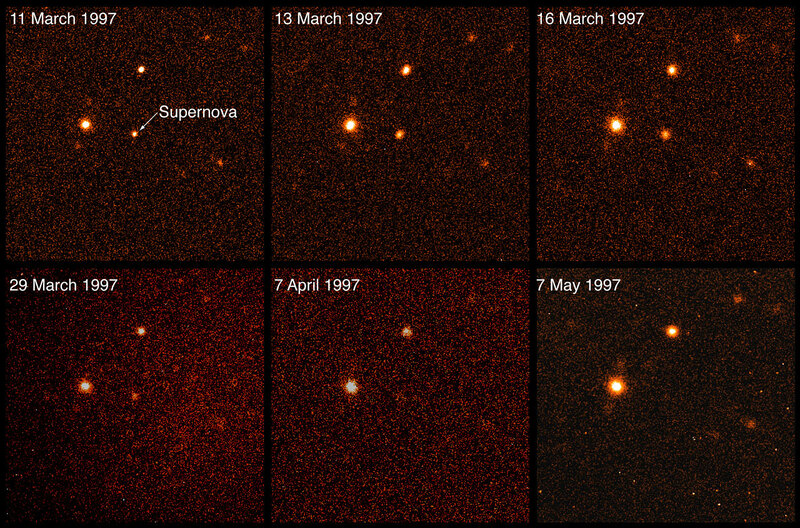 These explosions, known as Type Ia Supernovae , are distinguished by their very uniform properties, including their intrinsic brightness; this makes them ideal for the measurement of large distances, cf. eso9509. It is by means of observations of remote objects of this type that the all-important distances could be determined with sufficient accuracy. 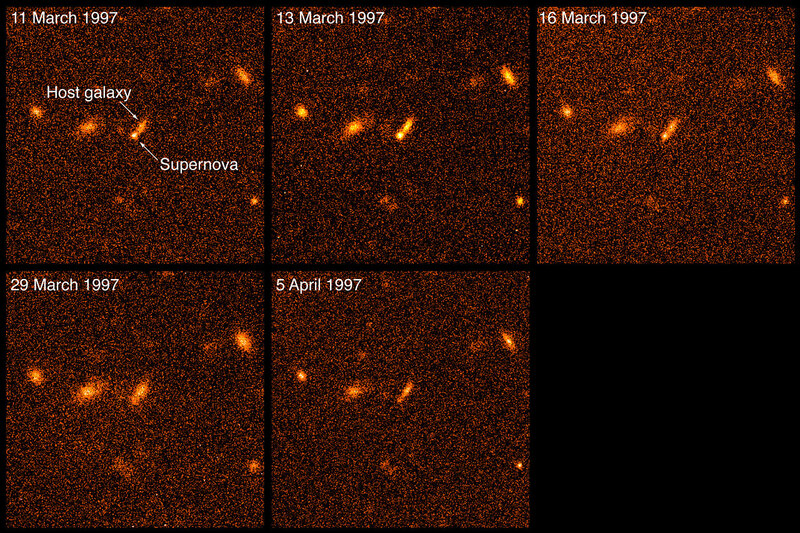 In particular, coordinated observing campaigns of Type Ia Supernovae were carried out at several of the world's major observatories. In this way it became possible to secure the crucial data that provide the basis of the new analysis. The new observations show that, compared to their nearby twins, distant supernovae appear too dim, even for a Universe which has been freely coasting (i.e. with no change of the expansion velocity) for the last several billion years (corresponding to redshifts of about 0.5). The only reasonable interpretation of these data implies that the measured distances are larger than what they would be in a "non-braking" Universe. This means that the distances to the supernovae must have increased over and above what they would have been if the rate of expansion did not change with time. This is only possible by the effect of additional acceleration , i.e., the rate of expansion of the Universe increases with time. The acceleration comes from a repulsive force . This concept was introduced by Albert Einstein, as the cosmological constant . There are several important implications from this new result. The corresponding, deduced age of the Universe , now about 14,000 - 15,000 million years, no longer conflicts with that of the oldest known stellar objects in globular clusters. Moreover, the spatial geometry of the Universe appears to be "flat" - this is a strong confirmation of inflation (a short phase of very rapid expansion) in the very early Universe. Ordinary matter, which comprises everything we know - from the atom to the stars - is composed of baryonic matter . It has been realized over the last few years that the matter we observe directly is only a fraction of all mass that is actually present in galaxies and clusters of galaxies, as estimated from measurements of internal motions in these objects. This has been referred to as the "dark matter problem" . Following the new measurements, a new component, "dark energy" (i.e., energy of the vacuum), must be added. It appears that this form of energy is dominating the Universe at the current time. There is a profound philosophical repositioning of humankind implied by this result. This follows the first step which was taken by Copernicus who in the mid-sixteenth century dislodged us from the centre of the Universe. Not only does the material from which the visible galaxies, stars, the Earth and its inhabitants are made comprise only a small fration of the gravitating mass in the Universe. There is now a new component, the "dark energy" which joins the "dark matter" in shaping the large-scale geometric and dynamical structure. Clearly, more observations are needed to further support the findings described here. They will soon be forthcoming, especially from new and large telescopes like the ESO Very Large Telescope (VLT), that has recently delivered its first, impressive results. But already now, on the verge of the new millenium, we are having a first glimpse of extremely exciting and fundamental aspects in the continuing human quest for the deep truths of nature. The ESO members of the "High-z Supernova Search" team (see URL: http://cfa-www.harvard.edu/cfa/oir/Research/supernova/HighZ.html) are Bruno Leibundgut and Patrick Woudt (ESO HQ, Garching, Germany) and Jason Spyromilio (Paranal Observatory, Chile). Chris Lidman (La Silla Observatory, Chile) and Isobel Hook (formerly ESO HQ, now Royal Observatory, Edinburgh, UK) are members of the "Supernova Cosmology Project" (see URL: http://www-supernova.lbl.gov/). The astronomers mostly used the ESO 3.6-m and 3.6-m NTT telescopes at La Silla for these research programmes. In astronomy, the redshift (z) denotes the fraction by which the lines in the spectrum of an object are shifted towards longer wavelengths. The observed redshift of a distant galaxy or quasar gives a direct estimate of the universal expansion (i.e. the "recession velocity"). Since this expansion rate increases with the distance, the velocity is itself a function (the Hubble relation) of the distance to the object. For instance, a redshift of z = 0.1 corresponds to a velocity of 30,000 km/sec, and assuming a Hubble constant of 20 km/sec per million light-years, to a distance of about 1,500 million light-years. Technical information: All images were obtained through an R (red) optical filtre. The image quality varies somewhat from image to image. Exposure times and seeing values: ESO Press Photo eso9861 - 11 March (300 sec; 0.73 arcsec); 13 March (600 sec; 0.79 arcsec); 16 March (600 sec; 0.72 arcsec); 29 March (1200 sec; 1.17 arcsec); 5 April (300 sec; 0.55 arcsec) ESO Press Photo eso9861 - 11 March (300 sec; 0.50 arcsec); 13 March (600 sec; 0.81 arcsec); 16 March (600 sec; 0.90 arcsec); 29 March (1200 sec; 0.83 arcsec); 7 April (300 sec; 1.43 arcsec); 7 May (1800 sec; 1.22 arcsec).